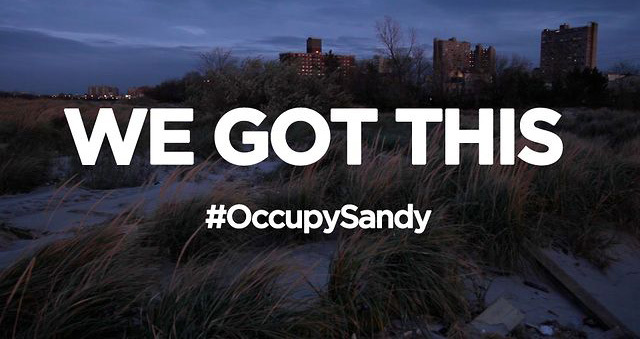 To mark the anniversary of Superstorm Sandy, Josh Fox is encouraging people to watch his short film on storm cleanup and relief efforts, Occupy Sandy. Fox, better known for his two full length documentaries on hydrofracking, Gasland and Gasland II, also makes short films. He made the 25-minute video on Sandy and its connection to climate change at the end of last year. The film offers a powerful lesson in the need for communities and households to be prepared and not to expect much help from the authorities. Occupy Sandy offers an inspiring portrait of the volunteers, mostly young people who had camped out in Zuccotti Park as part the Occupy Wall Street demonstrations, who went out to seaside communities that looked like war zones after the storm to knock on doors to check on residents and offer them food, blankets and medicine. The film’s primary message is that Sandy should be a wake up call for America to finally get serious about climate change. “There is a wake up call and there is a lesson to be learned,” says New York Governor Andrew Cuomo in the film. There is a reality that has existed for a long time that we have been blind to. And that is climate change, extreme weather, call it what you will, and our vulnerability to it. It is undeniable today. Thirty-three billion dollars. Loss of life. Weeks of inconvenience. Weeks with the city paralyzed. The question is, how do we make sure it doesn’t happen again or reduce the damage if it does? Yet, as Fox predicted, neither Cuomo nor New York City Mayor Bloomberg committed to get the city or the state off of fossil fuels. And for Fox, anything less is just not enough. Susan, thanks for the info. So far our raised bed is doing fine. And we’ll see how it does over the next few years.